In one of my very first posts here on my Transatlantic Gardener blog – ten years and 861 posts ago – I commented on the number of apple trees growing by the roadside. Since then there seem to be more and more, as passengers throw apple cores out of their car windows although, unfortunately, some of the best British examples have been destroyed by road widening. Now, having not really paid attention (I have to say), I find that an apple found by a roadside in 2003 was introduced in 2010. I spotted the story in the latest catalogue from Pomona Fruits, one of Britain’s finest fruit nurseries. The apple is called ‘Christmas Pippin’ and it’s an easy-to-grow version of Britain’s all time favourite apple, ‘Cox’s Orange Pippin’. “The eating quality is exceptional,” say the good people at Pomona Fruits, “characterised by a sweet and aromatic flavour, lovely perfume and a very pleasant honey after-taste. The fruits are crisp and juicy with a melt in the mouth texture that makes each bite increasingly more pleasurable.” They also say that it’s “very easy to grow and produces reliable, heavy crops countrywide.” Sounds like the perfect apple and the Royal Horticultural Society thought it so good that they gave it their Award of Garden Merit in 2014. ‘Christmas Pippin’ was spotted by the side of the M5 motorway in Somerset in western England, assessed at Britain’s National Fruit Collection and at the country’s largest commercial grower of apple trees and introduced in 2010. It was awarded the Royal Horticultural Society Award of Garden Merit in 2014. You can read the full story here. In this case it turns out that ‘Christmas Pippin’ is probably a seedling from a lost tree that once grew in an orchard nearby. It's available in Britain from Pomona Fruits but unfortunately it doesn’t yet seem to be available in North America. Driving around Pennsylvania or Northamptonshire, while keeping my eyes on the road, my peripheral vision always takes in what’s growing by the roadside. And there’s plenty to see. One of the very first posts on this blog, way back in 2007, was about unexpected roadside plants and here we are almost ten years later and over the last few days I’ve spotted some more. First, let’s revisit the Heathrow euphorbias (above). Having driven round the exit from London’s orbital motorway, the M25, for Heathrow every few months for more than fifteen years – about four years ago I spotted Mediterranean euphorbias bursting through the barrier. Driving my wife judy to the airport last week she snapped this picture on her phone through the car window as we whizzed by. Those euphorbias are still going strong. Later, on the way home to Northamptonshire, I spotted something interesting as I turned off the northbound M1 motorway to head home. And it turned out to be a strange mixture of plants: stinking hellebore (Helleborus foetidus) (below) scattered by the side of the road along with Euphorbia amygdaloides var. robbiae, grape hyacinths (Muscari), jonquil daffodils, flowering currant (Ribes sanguineum) and more: a strange mix of garden plants at an exit that’s a long way from a garden. And then just yesterday, on the way back from the recycling centre, doing very nicely by the roadside – two or three patches of another Mediterranean plant: Alexanders (Smyrnium olustratum) (above right). The Flora of Northamptonshire tells me that it: “originates from it formerly being grown as a medicinal herb”. Now that our roadsides are not treated like lawns and mown every two or three weeks, there’s more and more interesting plants to see. Gardeners and botanists both use common names as well as scientific names when referring to plants. Using common names for plants is more widespread in North America than it is in Britain, even among botanists, and even though common names are often simply made up if there doesn’t seem to be one already in use. But common names are confusing. After all, there are more than twenty different plants, from around the world, that are called “bluebells”. Native Americans must have had local names for many native plants when settlers first arrived in North America but the settlers didn’t bother to learn them and simply made up new ones - or, as with birds like the robin, transferred a familiar common name to a plant that looked vaguely similar to one from back home. So when I saw a large mature sycamore (above) way across the Delaware River the other day, its white branches ghosting against the oaks and maples behind, I was reminded of this: in Europe, sycamore is used for Acer pseudoplatanus; here in North America sycamore is Platanus occidentalis. The leaves are very similar, so I presume settlers simply transferred the name. But surely, native Americans must have had a common name for P. occidentalis. After all, I’m told they used to tap it for sap in the same way as sugar maples. In Europe, P. occidentalis is the plane tree and its hybrid with P. orientalis is a familiar city street tree. In Paris, large plane trees in the streets are pruned – literally – into a plane with all the branches parallel to the street and none overhanging. The sycamore of Europe, Acer pseudoplatanus (below) - whose botanical name, by the way, literally translates as “the maple that looks like a plane tree”! - is a menace. There’s a huge one in our neighbor’s garden in England and its seedlings spring up all over the place. What’s worse is that they get their new roots down deep quickly so that even when they’re less than a foot high they can be tough to extract, especially between the cracks in paving. I’d much rather have the American version. Acer speudoplatanus image (above) © Jean-Pol Grandmont. Licensed under the Creative Commons Attribution-Share Alike 3.0 Unported license. One of the most interesting features in the BSBI News, the magazine for members of the Botanical Society of Britain and Ireland, is the section headed Adventives & Alien News. This is where news of the more interesting non-native arrivals is posted. In the current issue there’s news of two related plants very rarely seen in Britain, one so unexpected that it gets a short article all to itself. The most surprising news is that Pelargonium inodorum (above), a native of Australia and New Zealand, and not grown in British gardens, has been found growing on the Isle of Wight - off the south coast of England. Spotted last September, it was happily flowering away on a sandy bank near a boating lake in the town of Ryde, across the road from the beach. It seems to have been there for a few years as there are large and small plants. Interestingly, it is also said to have become established in California, but the California Native Plant Society has no records. So often, when a non-native plant turns up in the wild in America, the reaction is to discuss how to eliminate it. The Botanical Society of Britain and Ireland publishes records and monitors the continuing status of new arrivals so that any such decisions can have a scientific basis. As it happens, there’s news of a related plant that has also started turning up on the Isle of Wight. A heron’s bill that’s native to North Africa, Erodium trifolium (left), was first spotted near Dartford in Kent in 1999, but has now been found in two different places on the Isle of Wight. A large plant was found on an industrial estate and half a dozen plants on a mown roadside verge. That original find in Kent was described as “an extensive weed on walls and roadsides”. This is a very attractive species which is grown in gardens and listed in the latest RHS Plant Finder as stocked by five nurseries, none of which are on the Isle of Wight. * purple-flowered Verbascum phoenicium, found in Staffordshire in the English midlands. The point of all this is that recording these plants, and following their status over time, is the basic science from which conclusions can be drawn about their spread – or their disappearance. Indigofera hirsuta is considered invasive in parts of North America, but a plant of the closely related Indigofera heterantha found in Sussex in 2012 has since gone. We need to know when species do not spread as well as when they do. Ripping them out as soon as we see them tells us nothing. Thank you to Peter Heenan of Landcare Research for permission to use his image of Pelargonium inodorum. The image of Erodium trifolium is licensed under the Creative Commons Attribution-Share Alike 3.0 Unported license. Details here. This is a tale of two corydalis. One spreads steadily, but very slowly, the other is worrying the invasive plants people. Corydalis solida ‘Blushing Girl’ (above) is a spring ephemeral for woodland conditions, at its peak today. It comes and goes relatively quickly in spring, then its little tubers sit and wait to do it all again the following year. The soft pink of its crowded flower heads is lovely, but it spreads only slowly. Corydalis solida has a wide European distribution and this form originates from the great Latvian plantsman Janis Ruskans. It was available in the US from the late lamented Seneca Hill Nursery but no one, not even Odyssey Bulbs who list a huge range, seems to list it. In the UK, there are three stockists. Since I’ve started feeding my clump with Miracle-Gro it’s spreading; I split it last year and it’s increasing noticeably. However, no seedlings. This is because individual clones of Corydalis solida are self incompatible – they will not set seed when fertilized with their own pollen. I’ve been tempted to buy one or two different ones, so they’ll cross and I’ll get seedlings. Now I wish I had, but I'd been trying to be sure that the lovely ‘Blushing Girl’ stayed true. By contrast, there’s Corydalis incisa. This is an annual or biennial from Japan, Korea, Taiwan and China described as “startling” by the authors of the excellent book Bleeding, Hearts, Corydalis and Their Relatives (Available in Britain from amazon.co.uk and available in North America from amazon.com). They also say that they’ve seen it naturalized along the Bronx River in New York City. As you’ll have guessed, no incompatability problems here and it now seems to be spreading in the City sufficiently to have alerted The New York Botanical Garden. It’s also been spotted elsewhere on the east coast: Maryland, DC, and Virginia. This is not a plant that’s widely grown in gardens, it’s stocked by four UK nurseries and by Sunshine Farm & Gardens in the US so, I have to say, it’s entirely possible that it escaped from one of the City’s botanical gardens! But let’s not get carried away. Of course, we don't want another plant smothering our natives along river banks and in flood plains. But it It’s only been seen as an escape for a few years – which, in ecological time, is just a moment– and, as we know, sometimes plants that seem threatening just fade away. In the meantime, enjoy ‘Blushing Girl’ and the many other forms of Corydalis solida. I’m going to keep pouring on the Miracle-Gro and take a closer look at those listed by Odyssey Bulbs. Had a jolly time at my niece’s wedding on Saturday up in Woodstock, New York (where the festival famously wasn’t) and, as ever, spotted something of horticultural interest. The bold floral displays at the ceremony featured gladioli in autumnal orange with purple amaranthus and all backed by – burning bush, Euonymus alatus. Click the image to enlarge it and see the foliage more clearly. It’s not often that we see Euonymus alatus used as cut foliage. It makes a spectacular feature in the landscape with its brilliant fall color and is also being mentioned as a worrying invasive. But not many people have the bright idea of using it for cutting. And one of the appealing things about it is that the older leaves color first so that at along one branch the foliage color changes from purple-tinted green at the tips to puce or brilliant scarlet at the base and this creates possibilities of harmonies with a range of colors. A feature worth keeping in mind is that many of the plants we grow are seedlings, so no two are exactly the same. The result is that different individual plants reach the peak of their fall color at different times. The foliage from two plants growing side by side in our Pennsylvania garden (right, click to enlarge) shows one at peak of color and one still some way off. This is a great advantage for cutting as it ensures that material is available over a longer period but in the garden, and especially when grown as an informal hedge, a mix of brilliant red and almost green foliage is much less effective than a continuous dazzle of scarlet. Then, of course, there’s the issue of invasiveness. It grows naturally in China and Japan but planting burning bush is banned in Massachusetts and the plant is cited as invasive in Connecticut but I don't think it will ever be the menace of plants like Japanese knotweed because the deer eat it. The plants in the unfenced part of our garden ahave been eaten bare to about 5ft//1.5m and seedlings never grow more than a few inches before being eaten. But, if you’d rather be cautious, there’s the varieties ‘Rudy Haag’ and Little Moses (‘Odom’) which set almost no seeds so are far less likely to spread. But, for cutting, they have the disadvantage of being dwarf and slow growing, as do most of the other named sorts including ‘Compactus’, ‘Fire Ball’ and ‘Timber Creek’. But burning bush has two other attractive features, both more noticeable when stems are cut for the arrangements and after the leaves have finally fallen. The winged stems of mature branches are a striking feature and while ‘Blade Runner’ has broader wings than other varieties var. apterus and ‘Compactus’ are less noticeably winged. And then there are those reddish purple fruits which split to reveal orange seeds. They last well and line the branches in winter. I couldn’t find any info on how to treat cut burning bush stems to ensure they last as long as possible in the vase. My usual bible on cutting woody material is the invaluable Woody Cut Stems For Growers and Florists by Lane Greer and John M. Dole (available from amazon.com and from amazon.co.uk) but it concentrates on evergreen Euonymus species. So if anyone has any thoughts on how to ensure the fall foliage of Euonymus alatus lasts well in the vase, please post a comment. Himalayan balsam, Impatiens glandulifera, is a common plant of British riversides, pond margins and other wet places and is always said to be too invasive for us to be allowed to grow. It looks as if it’s smothering everything else where it grows, so it’s banned. It can be a lovely plant, so not being allowed to grow it is unfortunate. On my recent short visit back to England I saw it along the River Nene in Northamptonshire (along with the American native Imaptiens capensis), by the Wey Navigation Canal and River Wey in Surrey and in other waterside places. Some stands of it looked dense and were well over 6ft/2m high. But the most striking feature was the colours. The flowers varied from cherry red through various purplish and pink shades, including some pretty bicoloured forms, to almost white. Years ago I used to grow a pure white form called ‘Candida’ (with none of the anthocyanins that bring the red and pink colouring); it’s very pretty, but those pale flowered plants I came across this year all had a faint blush of pink. Also known as policeman’s helmet from the similarity of the flower shape (though not the colour!) to the helmets worn by London policemen, it’s listed as a noxious weed in three US states though it’s not yet found in most country. However – is it really that bad? Needless to say Ken Thompson gives us the low down in his latest book, Where Do Camels Belong? The Story and Science of Invasive Species. Himalayan balsam in Britain, like purple loosestrife (Lythrum salicaria) in North America, turns out to be an example of a plant that looks as if it’s smothering everything to extinction while the basic science tells a different story. Dr. Thompson reports that a large scientific study that compared areas that had been invaded with similar habitats that had not concluded that “it (Himalayan balsam) does not represent threat to the plant diversity of invaded areas”. But although one visual assessment turns out to be misjudged, another turns out to be valid. The late flowering of Impatiens glandulifera provides valuable food for bees when few other plants in its favoured damp habitats are flowering. So it’s actually quite useful as well as attractive – so it’s shame that we’re not supposed to grow it. Sometimes, people ignore plants simply because they're common. We see them all the time, even growing by the side of the road, and they sink into our subconscious and simply fail to emerge. What is sometimes called the perennial sweet pea, or everlasting pea, is a case in point. Lathyrus latifolius is easy to grow, we see patches thriving along sunny roadsides in Britain and in North America, and in gardens it may annoy us as it can be uncomfortably vigorous. But it’s very colourful, very productive, clings to fences or shrubs with its tendrils and is a splendid long lasting cut flower. If it were scented there’d be hundreds of varieties. It’s been used to control erosion in North America, and its ability to prevent the germination and development of shrubs has led to its planting along utility lines to ensure access remains unblocked by shrubby growth. A variety has even been developed, ‘Lancer’, specifically for practical use. It grows more upright than others, has superior seedling vigor, is a good seed producer and also has a better blend of colours than other mixtures. In a few parts of the US it’s seen as a noxious weed but, on the other hand, the United States Department of Agriculture provides detailed instructions on how best to sow it and grow it when using it for erosion control etc. In gardens it can be quite a spectacle, and is lovely clinging to a rustic fence or to a robust old shrub rose (right, click to enlarge). There are three basic color forms – magenta, pale pink and white – but, in his book on sweet peas, Roger Parsons lists ten varieties (plus a number of synonyms) although the names are not now applied with much care or precision, especially with regard to flower size. But look for ‘Blushing Bride’ (blushed white), ‘Rosa Perle’ (pink, above - click to enlarge), ‘Red Pearl’ (magenta) and ‘White Pearl’ (white). And if you come across ‘Wendy’s Joy’, with mauve flowers, grow it and pass it round – although dividing the root is the only way to be sure it stays true. Lathyrus latifolius also makes a long lasting cut flower, with up to a dozen flowers on a spike, and is valuable in itself and also to fill out bunches of scented sweet peas. The challenge is to control the vigor of the beast and encourage it to produce long stems. Training the stems on wires does the trick and tends to create long straight flower stems which are easy to reach for picking. So next time you notice Lathyrus latifolius flowering by the side of the road (as in Suffolk in eastern England, below, click to enlarge) remember what a fine garden plant it is and look out for the best varieties. Purple loosestrife - is it really that bad? It’s purple loosestrife season here in Pennsylvania. Swamps and other wet habitats are vivid in its purple coloring (above, click to enlarge), in some places it looks as if it’s smothered everything. This colourful European native is generally viewed as a destructive menace and many millions of dollars are spent every year in a futile attempt to eradicate it. In Britain, by the way, where purple loosestrife (Lythrum salicaria) originated, it’s far less common and is a popular plant for bog gardens with over a dozen named varieties, two of which have been awarded the prestigious Award of Garden Merit by the Royal Horticultural Society. My local experience indicates that it does not necessarily spread once the first plant arrives, and that it can also decrease over time. On the lake where we live, I spotted two plants growing together about ten years ago. I checked the whole lake last week and those two plants are still the only ones present in spite of there being many suitable habitats all along the margins. Native swamp loosestrife, Decodon verticillatus, is far far more aggressive. And in the swamp where I first saw it flowering colorfully it has declined, as it has elsewhere, and a striking feature is that native shrubs including dogwood (Cornus) and arrowwood (Viburnum) are establishing themselves on individual clumps of purple loosestrife. And it’s not as if purple loosestrife is entirely useless for wildlife. It’s been shown that a number of native species are more likely to grow in habitats containing purple loosestrife and in a study of over 250 plots it was found that there were more birds in those with purple loosestrife than in those without. I’ve seen around thirty individual butterflies on one plant and over sixty insect genera use it, including adult monarchs (left, click to enlarge). Birds even nest in it. Another significant study that looked carefully at this issue found that there was no difference in species richness between plots with and those without purple loosestrife. I was tempted to pull out those first two plants that appeared at the far end of our lake but I just left them and kept an eye on the situation. Ten years later they’re doing no harm. Don’t get me wrong. I’m not saying that anything and everything that could be, and is, invasive should just be left alone. What I am saying is that it’s not as simple as “native good, non-native bad”. Especially when you look at how fast US native swamp loosestrife (Decodon verticillatus) can spread and the monocultures that result. Monarch butterfly on Purple Loosestrife (Lythrim salicaria). Image © Liz West (http://www.EWestPhotos.com). Used here under Creative Commons Attribution 2.0 Generic License. Making the hour’s drive back and forth to my cardiac rehab three times a week, and often walking woodland trails on the other days, I’ve spotted some interesting plants along the way. A couple of years ago I wrote about a yellow-leaved form of common milkweed, Asclepias syriaca, which I spotted growing by the side of the road and last week in a quiet area at the back of the radiology unit (yes, I was just poking around…) I found a yellow-leaved plant of a different Asclepias species – A. tuberosa, butterfly weed. As you can see (left, click to enlarge) it looks very dramatic and doing very nicely amongst the crown vetch (Coronilla varia). There were also normal green-leaved plants scattered about the area, which had clearly been disturbed during construction work so we’ll see if that coloring was the freak result of something nasty in the soil or a genuine mutation. I’ll stop back later in the summer for another look. Just at the moment our local wild bergamot, Monarda fistulosa, is in full flower. This seems to be a “first respondent” if you like, one of those plants that quickly arrives in freshly disturbed soil on open sunny sites. It occurs as a few plants or in huge drifts which, when you look closely, include an occasional plant with darker, or paler flowers. But this week I screeched to a halt as I spotted a plant - just one - with white flowers (abiove right, click to enlarge). It turned out not to be the white flowered species M. clinopodia (which has a few purple spots on the flowers), but a genuine white-flowered form of M. fistulosa (wild bergamot). There were only a few plants in that location, but I’ve marked it and will collect some seed later. UPDATE That was a few days ago - and yesterday I found another one, twenty miles farther south. I've been all these years and never seen one white one, and now I come across two. I’d never stopped to look closely at all the shrubby honeysuckles along the roadside (please forgive my severe dereliction of botanical duty), they’re growing along a stretch of road where it’s not safe to stop the car. But they’re quite a sight in May when covered in white or cream or pink or red flowers, and again now when they’re in fruit. Then in a parking area the other day I spotted a plant with lovely amber orange berries (left, click to enlarge). Frankly, I’m not sure if it’s Lonicera maackii, L. morrowii, L. tatarica, or L. x bella (the hybrid between L. morrowii and L. tatarica) – all of which are collectively known as Asian Bush Honeysuckle; I’ll have to make more of an effort to check them when they flower next year. But, although I know they’re all rated as invasive, they’re very attractive especially those with brilliant scarlet berries (rather than a dull and dirty red) and this pretty amber berried form. And finally, on the way up the hill to the ledge from which I shot this wonderful picture of a field of Black-eyed Susans (Rudbeckia hirta) – a variegated oak seedling (below, click to enlarge). I think this may be the only one I’ve ever seen outside a botanic garden, and here it is growing by a woodland trail in Pike County, Pennsylvania. It’s a seedling of red oak, Quercus rubra, and a quick online search for variegated red oaks reveals only ‘Greg’s Variegated’ and one named as 'Foliis Variegatis' in the Journal of Arboriculture in October 1987. It’s growing very near the trail; I may have to move it to the garden in the fall. The only other one I’ll mention here is the vanishing trumpet vine (Campsis radicans). There are occasional plants all the way along my drive, all with the usual orange flowers. But, last week, I spotted one cluster of purplish red flowers. There was too much traffic to stop examine it but it turns out this is a known variation - ‘Atropurpurea’ – but very rarely seen. So rarely seen, in fact, that when I did stop a few days later – I couldn’t find it! Transatlantic views on garden plants, native plants, invasive plants, books about plants… Plus comment on wildlife, catalog(ue)s, the smartness and the absurdity of plant names, the transatlantic life, fishing, music and more... From Northamptonshire (zone 8) in England and the much icier Pennsylvania (zone 5) in the USA. 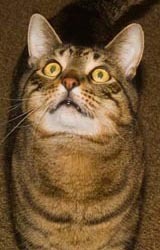 Follow me on Twitter for updates on my blogs and more. Click the Twitter logo. 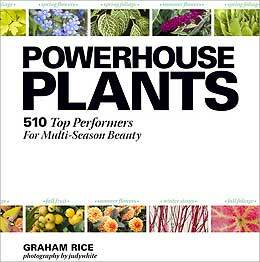 My latest book features over 500 individual plants with two, three or even four seasons of glory. Click below to find out more. 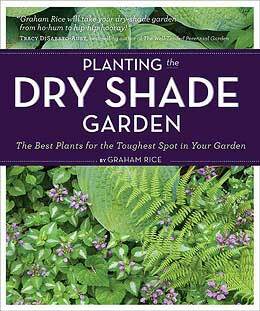 Planting The Dry Shade Garden reveals the best plants for this worst of all garden situations. Click below to find out more. 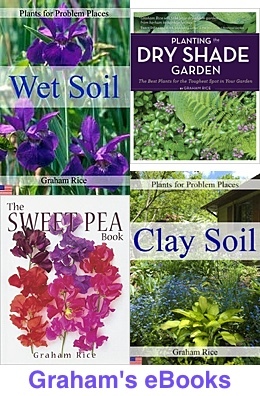 My ebooks for British and American gardeners - click on the covers. 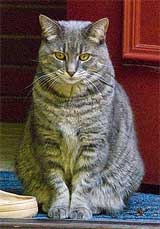 Click the picture to check out my British and Irish folk music public radio show, The Wagonload of Monkeys, and listen to the latest shows. All text is ©Graham Rice unless otherwise stated; all images so marked are ©GardenPhotos.com. To enquire about the use of text or images from this blog please contact me at graham@grahamrice.com.